Ages 5 through 10. 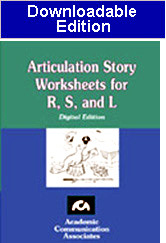 This downloadable publication includes reproducible, illustrated worksheets designed for use in remediating the R, S, and L sounds. Students are asked to tell stories about picture scenes that contain a variety of items with the target sounds. Sounds are targeting in all word positions. Space is included on the worksheets for recording the stories created by students. These worksheets can also be used for coloring activities. Scoring forms for recording correct and incorrect productions of the target sounds are included. The activities are designed for students who have learned to produce the target sounds at the word level. As student tell their stories, they practice using their target sounds in connected speech. The activities can be presented at school or they can be used for home practice. Encnourage students to be creative as they tell their original stories.